During my time spent working in Florida, I was able to get out on two short backpacking trips. The first of these was the Juniper Prairie Wilderness. The second time I was able to slip away from work for a night, I decided to undertake one of the few trails in the Everglades that can be hiked- the Coastal Prairie Trail. 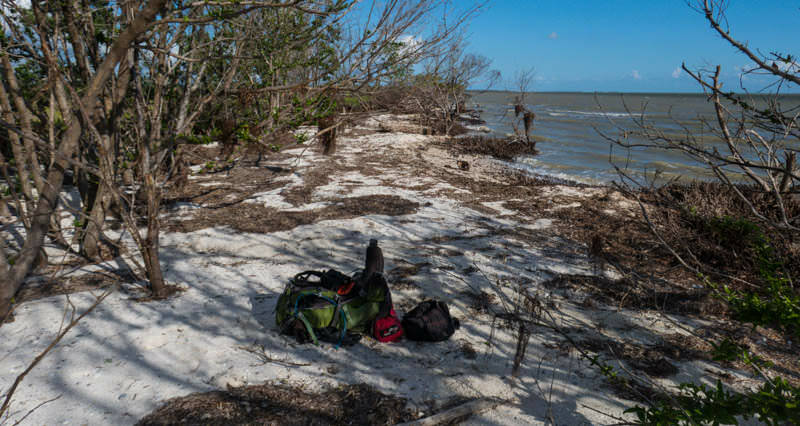 While the Everglades isn't exactly rife with hiking opportunities (most of the backcountry use is paddling), there are nevertheless a few opportunities for foot travel into backcountry campsites. 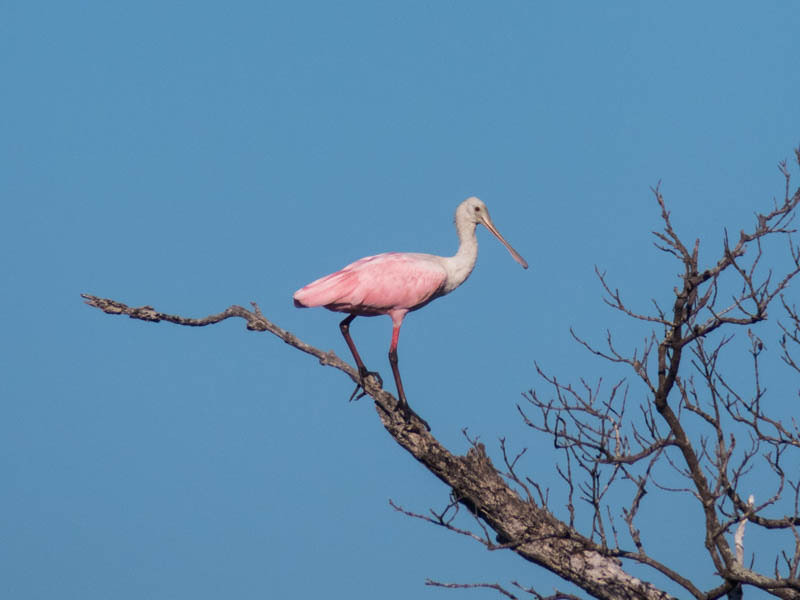 The Coastal Prairie Trail is a 6 mile trail through the Marjory Stoneman Douglas Wilderness that stretches west from the Flamingo visitor center along the extreme southern coast of mainland Florida, terminating at a moderately popular beach camping area named Clubhouse Beach. I selected this trail in particular as none of the other foot trails in the park could be used to access a remote beach campsite right on the ocean. 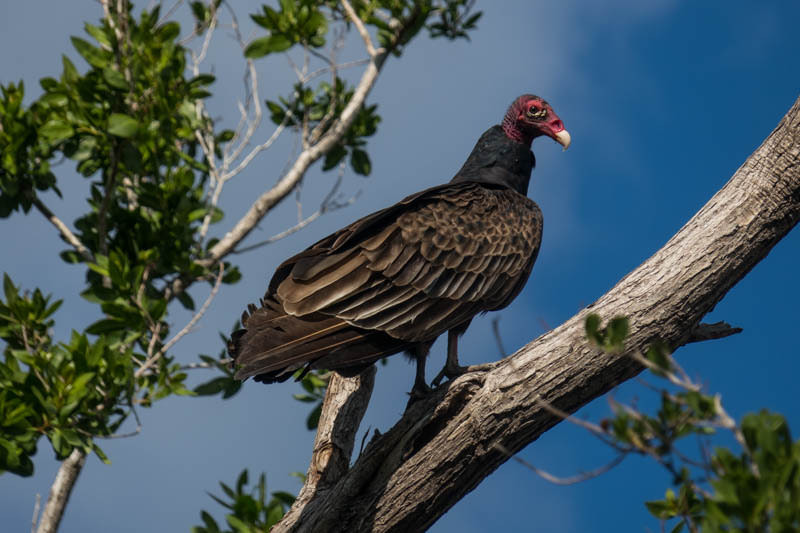 Backcountry camping in the Everglades requires a permit, but during the off season (the summer months), the permits are self-issued via an unmanned kiosk in Flamingo. My arrival at the park coincided with the normal beginning of tourist season (early December), but with much of the park still closed due to the impacts of the hurricane, there were no park employees around when I arrived. I found the binder with the permits, filled out the necessary info, and pocketed my copy without any issues. 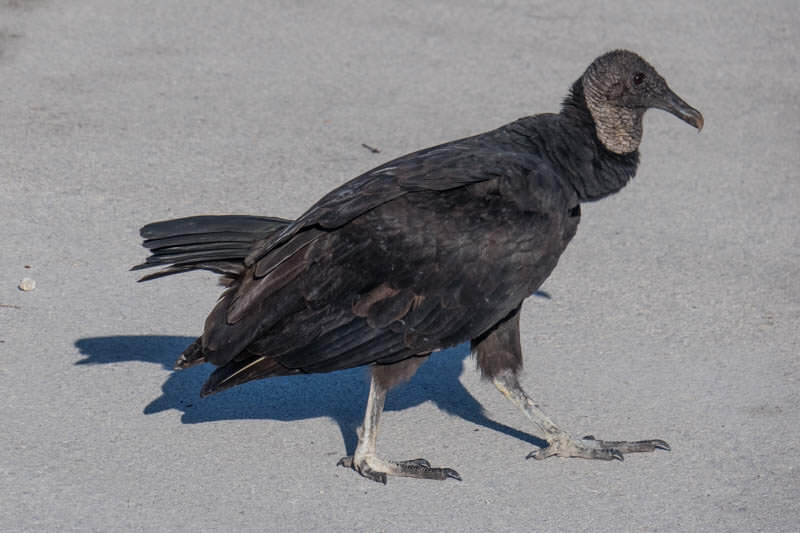 A small gang of black vultures eyed me closely as I did so, perhaps hoping that I'd drop some morsel of food for them (or even fall dead in my tracks). 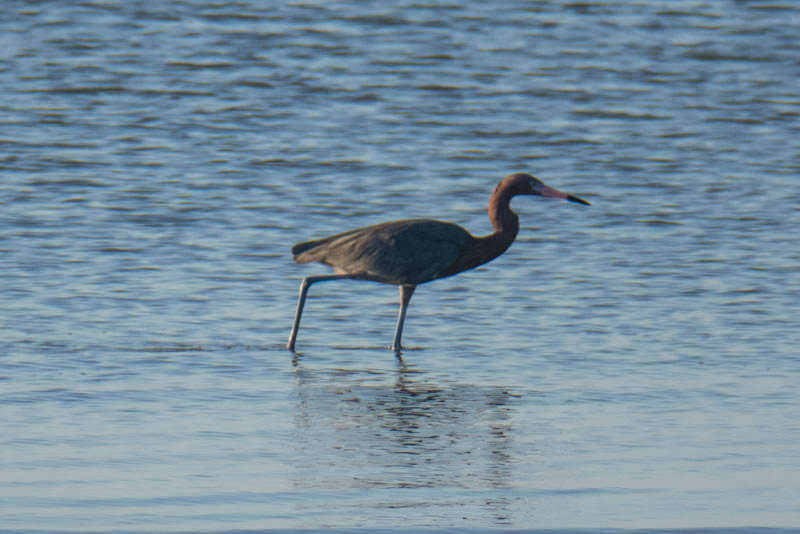 The trailhead for the Coastal Prairie Trail is located at the back end of the Flamingo campground. There's no parking right at the trailhead, and the campground was still closed for the season besides, but I was able to find a place to park without issue and was soon passing through the campground on foot. It appears as if a lot of the campground had been under water during the hurricane- there was a layer if dried mud, 1-2 inches thick, covering much of the ground. Many of the trees also appeared quite battered. My arrival at the trailhead proper presented me with a not-so-encouraging sight. I can't recall ever having seen a more foreboding trailhead in all of my travels. The trail was covered in blowdown, and clearly had seen no amount of maintenance at any recent point. I'd heard that this particular trail was not well maintained to begin with (as is the case with many trails in Federal Wilderness Areas), but this exceeded my expectations. 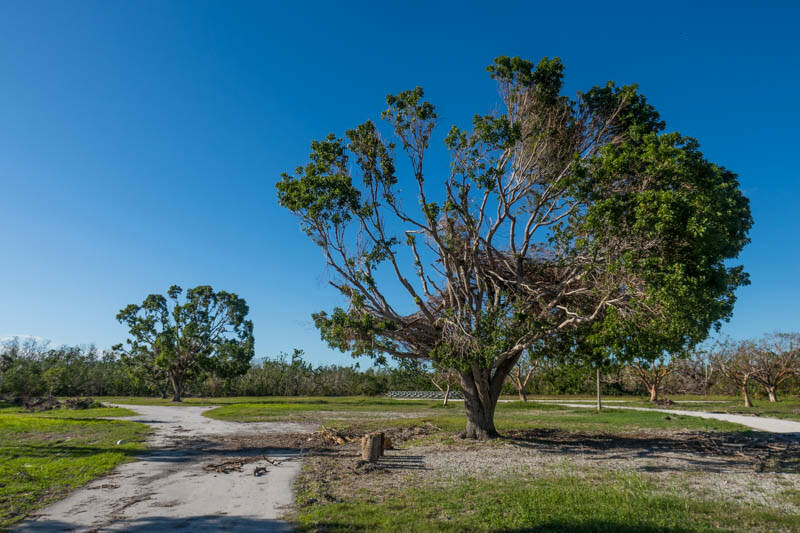 Not that I can blame the National Park Service- they certainly had their hands full repairing and rebuilding facilities in the non-Wilderness areas of the park after the extensive damage from the hurricane. After a brief foray through a dense buttonwood stand, the trail turned slightly to the north and emerged into the first section of coastal prairie proper. There was no blowdown to be found here, but what I did find instead was a thick, wet layer of mud. The kind of mud that takes extra effort to life your foot from, and also the kind of mud that forces you to exert twice the energy to walk through in comparison to walking on solid ground. This trail was definitely going to be slow, hard going. 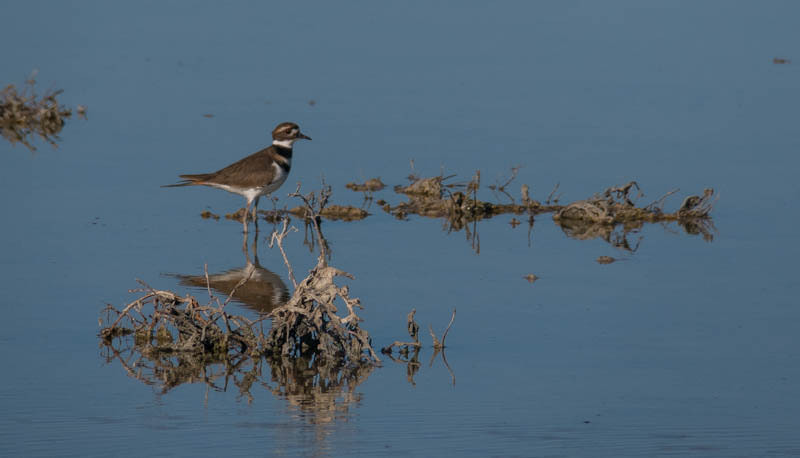 Before long, the thick mud gave way to standing water, anywhere from ankle to knee deep. For the next few miles, the trail would alternate back and forth between the mud and the water. The water as generally preferable to the mud- despite having soaking wet feet, I found that the ground beneath the water was more firm and solid, and thus easier to move across. My understanding that is that everything dries up into a firm, packed surface that is easy to hike on by about mid-January. 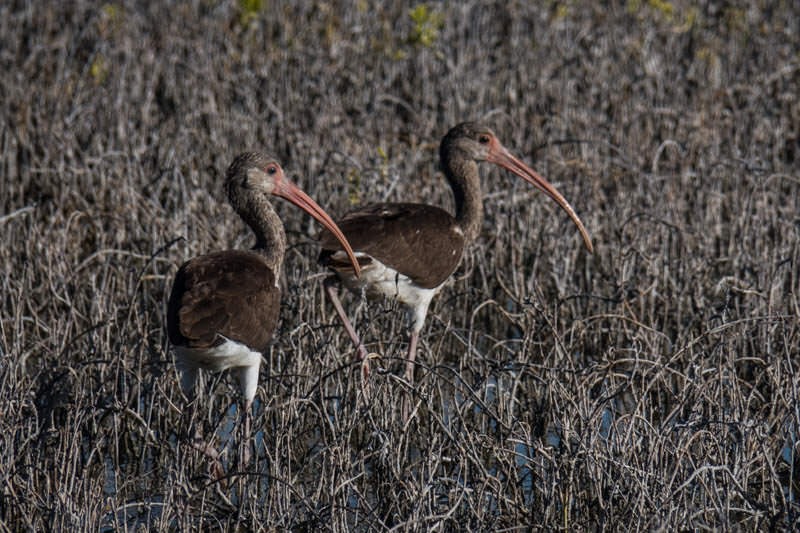 I was simply in the area too soon to take advantage of the dry season (which starts in November but it takes several months for the Everglades to dry out). 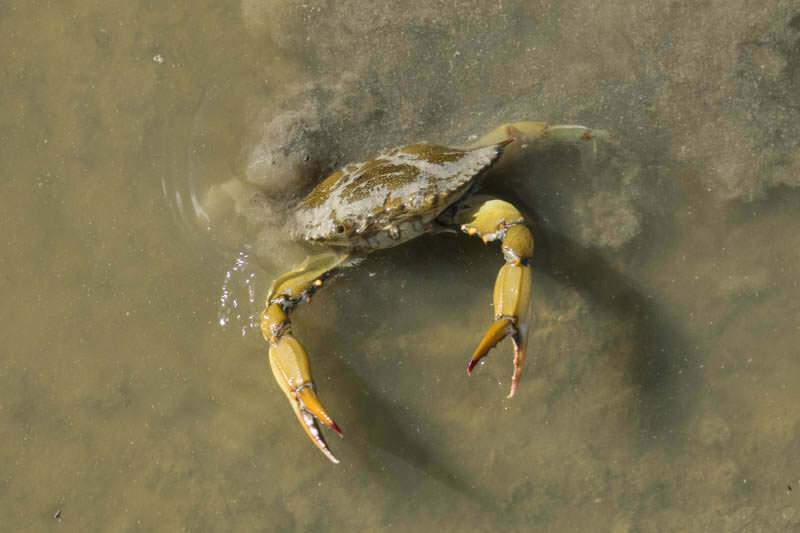 At one point, as I was sloshing through ankle deep water, I was startled by a blue crab that darted out of the low brush beside the trail and began to snap its pinchers at me. The crab was soon joined by several others- none of them ever actually pinched me, but they definitely clearly had no fear as they worked to defend their turf from the intruder. I also spotted an osprey nest, and not long after, observed an osprey itself fly by. 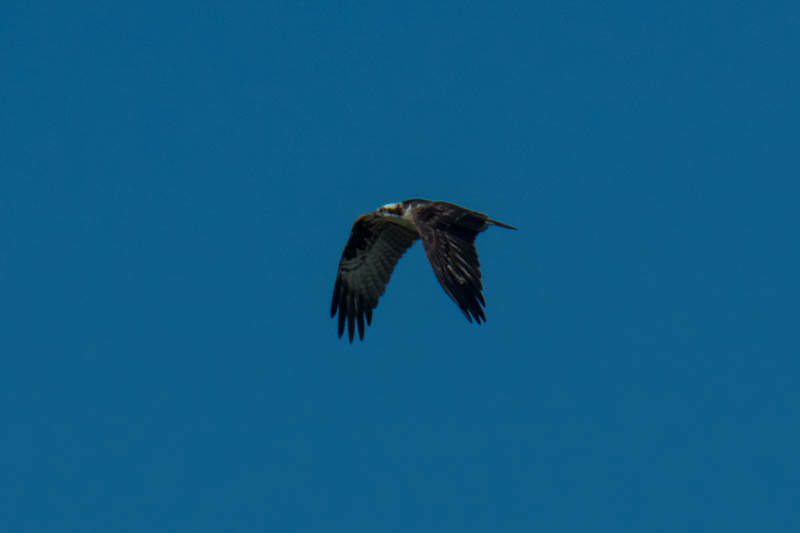 The osprey were really neat to watch- they loop and dive and twirl around without end. They're also pretty hard to get photos of for that same reason. 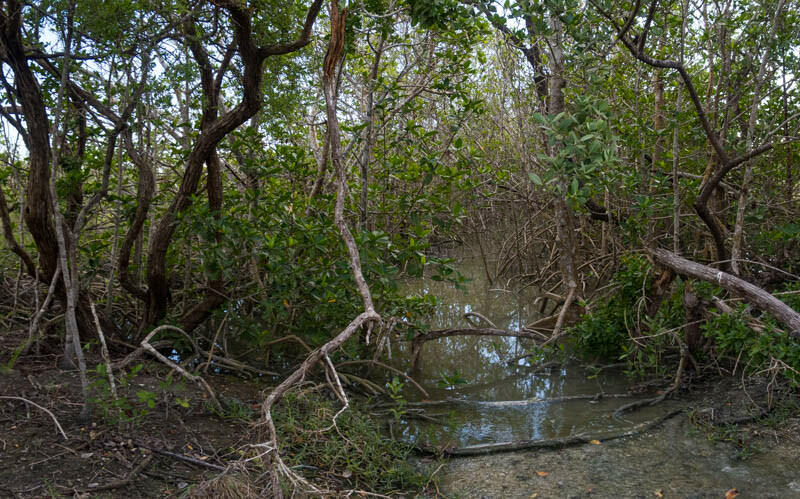 After several miles of muddy sloshing through the prairie, the trail entered a mangrove forest. Here, the surface of the trail was dry and firm, and the going would've been easy had there not been plenty of blowdown and generally overgrown stretches of trail. Thick spider webs also covered the trail, and I was constantly swatting these out of the way with a stick. With one exception, though (where I briefly lost the trail for a minute before finding it again), the tread was fairly obvious and there was no danger of losing the way. In fact, on this stretch I began to notice that the trail was actually following an old road. 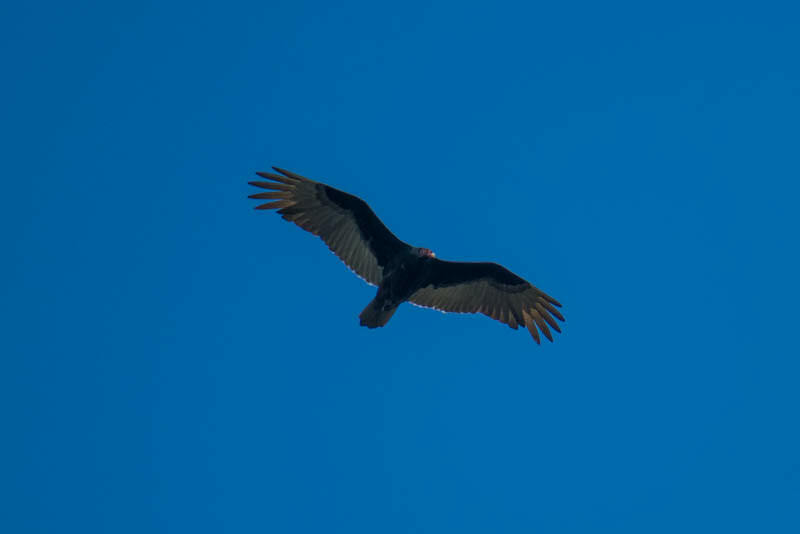 At one point, I spotted a turkey vulture watching me from a tree. Several others circled lazily in the sky. I also saw a box turtle. 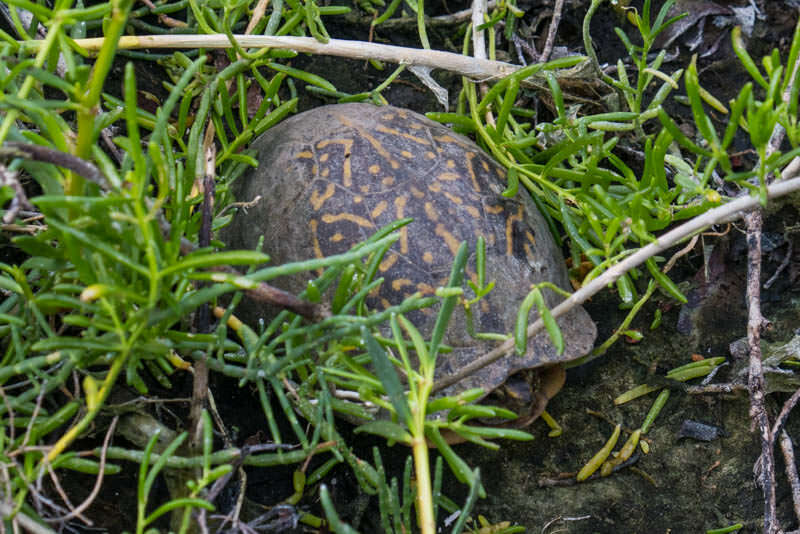 Box turtles are really neat- they can actually completely seal their shells from the inside, a skill that many species of turtle lack (despite what Saturday morning cartoons have lead many to believe). I was also lucky enough to be hiking while the buttonwoods (a type of mangrove) were in bloom. 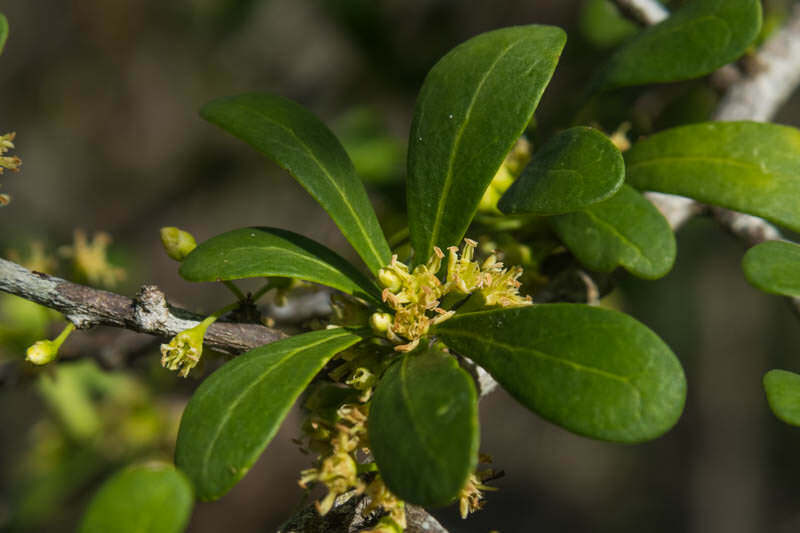 Buttonwood flowers are small and unassuming, but their scent is without out a doubt one of the strongest and most intoxicatingly-sweet smells I've ever experienced in my life. 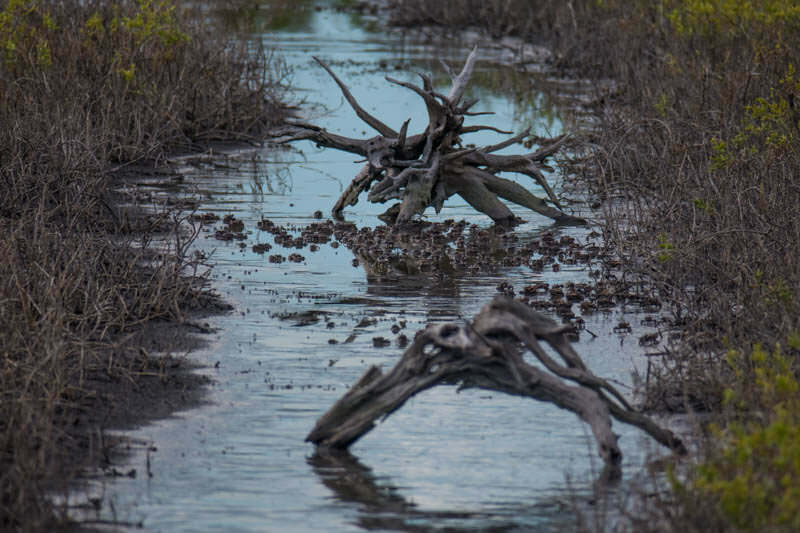 After another mile or so, the trail re-emerged from the mangrove forest into more coastal prairie, and the mud and standing water returned. This prairie was even more expansive than the one I'd hiked through previous, with far-ranging views. I also started to encounter roving bands of hermit crabs- some of which were comprised easily over several hundred crabs at least. Upon spotting me, they would all begin the process of scurrying out of my path, into the relative safety of the ground cover. At times, I could hear the clicking, chittering, and clacking of thousands of crabs around me as they moved off into the brush. It was a little surreal. 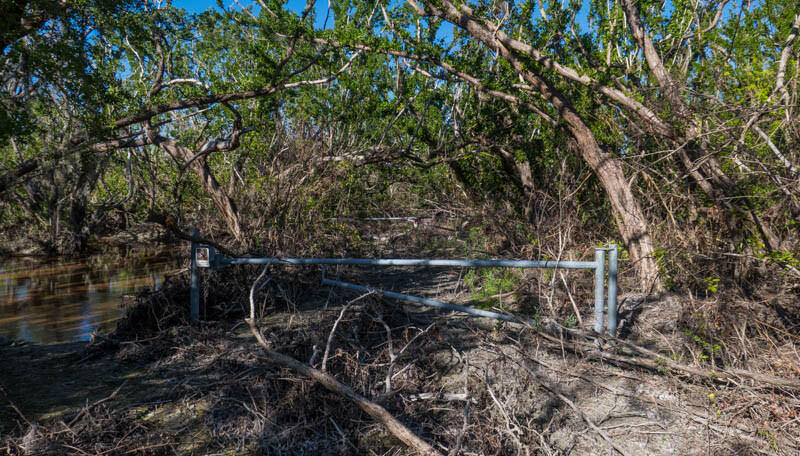 The trail briefly re-entered the mangroves and lead me to a man-made dike. To my initial shock, water was pouring away from the ocean and into the coastal plain. I quickly realized that this simply meant that the tide was up, and not that the laws of physics had in any way been broken. I knew from the map that crossing the dike meant that I was close to my destination- no more than a mile at the most. The trail soon re-emerged back out into the prairie, and I pressed on. Not far from the dike, a small plane started to circle around overhead above me. I'd seen a few low-flying planes throughout the day, and paid them no heed- but this one seem particularly interested in my specifically. 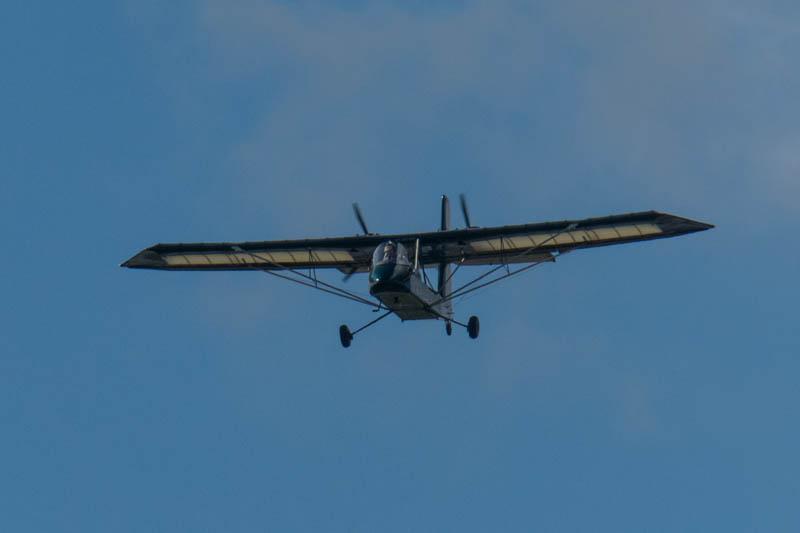 I suspect that the pilot saw a person, sloshing through knee deep water in the heart of the Everglades, miles from the nearest road, and decided that they might not be there by choice. After a few high passes, the pilot came around for a pretty low pass. I smiled, waved, and have him a visible thumbs up to let him know that I was OK, and he waved back and flew off. I also came across sea turtle tracks. They will wander inland to lay their eggs. 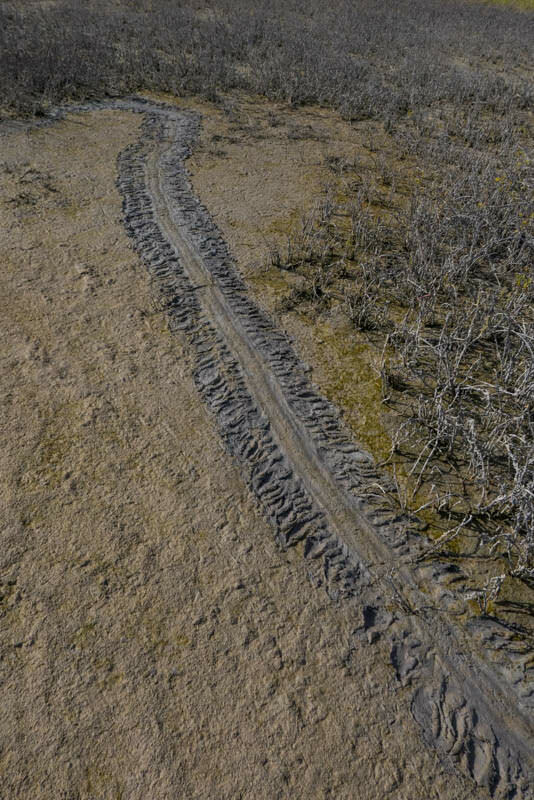 I never saw the turtle itself, but it was still neat the see the tracks. About a mile beyond the dike, any sign of a visible tread more or less faded into obscurity. I was fairly certain that I was pretty close to Clubhouse Beach- I could hear the surf crashing on the shore nearby. I was also fairly certain that the trail made a sharp left turn just before reaching the beach, but try as I might, I simply could not find any sign of a path in that direction- just deep water. I eventually decided to just press on as the water rose above my knees, almost to my waist. I kept thinking that this would be the perfect time to see an alligator, but I made it through the deep water without incident, and soon I was stepping out on the sands of Clubhouse Beach. Clubhouse Beach can at times be a popular place to camp (and the NPS will issue multiple permits to camp there for each night), but apart from a sail boat anchored some distance off shore, I had the beach entirely to myself. I picked a spot in an open stand of trees next to the beach, set up camp, and then spent an amazing afternoon by the ocean reading, listening to the crash of the surf, and watching the shore birds as they wandered up and down the beach in search of food. Evening brought with it a spectacular sunset and some amazing scenery. Evening also brought with it some of the worst bugs I've ever encountered in my life! 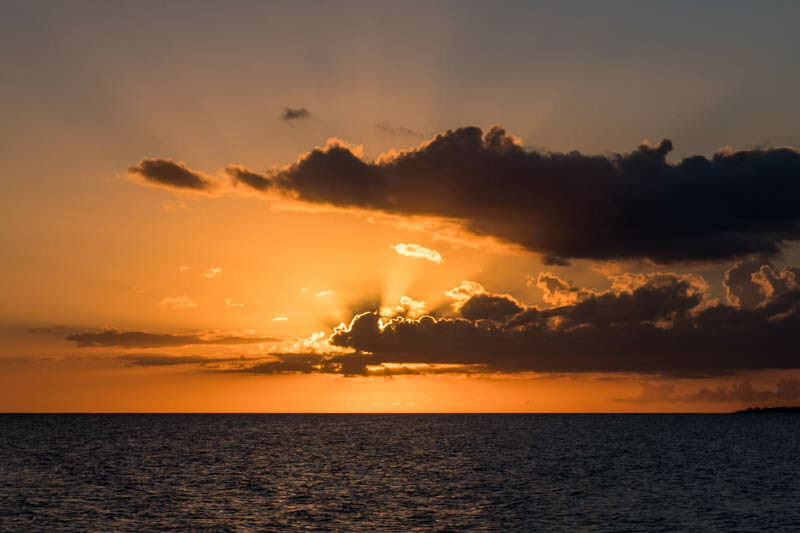 While the sun was still up, a steady breeze off of the ocean had kept them at bay, but once dark arrived and that breeze diminished, the no-see-ums especially came out in force. I was quick to dive into my tent for refuge. I spent a warm but not unpleasant night sleeping beneath the light of a full moon. I was up with sunrise the next morning, although I did wait for the wind to pick up again before leaving the shelter of my tent. 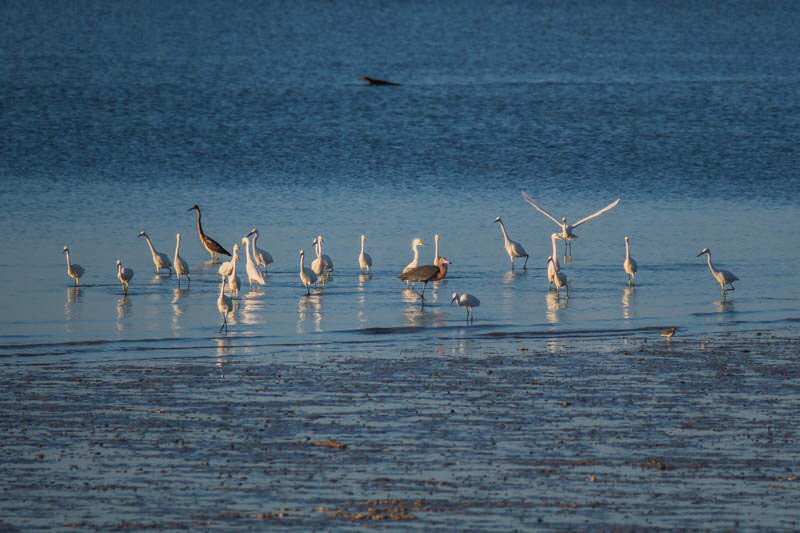 The beach in the morning was crowded with a wide variety of shore birds. I wanted to check out a few other spots in the Everglades that afternoon before returning to Miami, so it didn't take me long to get packed up and head out back to the trailhead. The hike back went a bit more quickly- I knew what to expect and wasn't worried about whether I'd be forced to turn back at some point or not. I'd hoped maybe that there'd be fewer spider webs, but they'd managed to completely rebuild everything during the night. 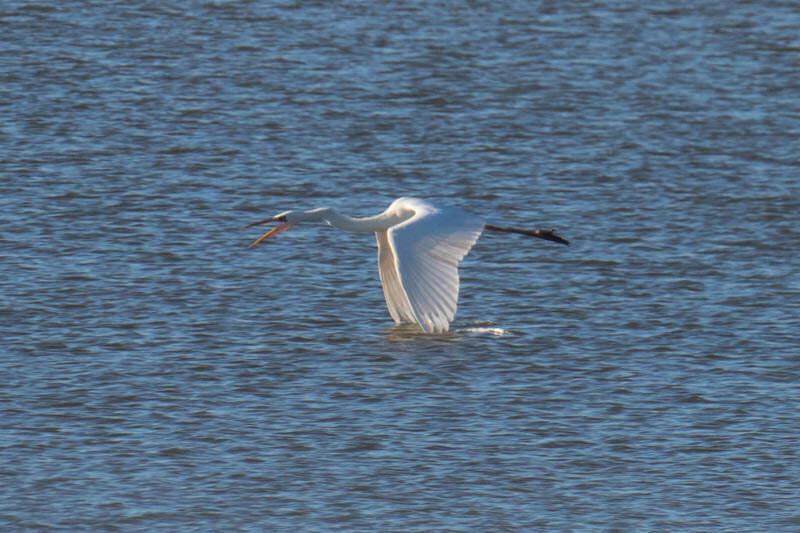 I did see quite few birds on the way, including spoonbills, ibises, egrets, plovers, and a killdeer. All in all, despite the mud, it was an enjoyable trip in an ecosystem that I've never really experienced before. Being able to camp on a remote ocean beach is definitely an experience that is worth pursuing. If I ever have the time, I'd love to return to paddle the 60 mile wilderness waterway that runs the full length of the Everglades- that would truly be a worthwhile experience, I think. awesome. thanks for sharing your adventure with us. Did you have to carry all your water, or was fresh available at all? I carried all of it. As I recall, I carried about 6 liters total, and used nearly all of it. I did sample some of the inland water, and it was pretty brackish.